Washington, DC is well known for its monuments and memorials. In DC There are so many different ones it's hard to remember them all. However, the ones that always seem to be remembered are Lincoln Memorial, Thomas Jefferson Memorial, and Washington Monument. We have done pet photos at all of these locations and they look stunning. In many cases we can photograph your dogs at all three locations in the same day often in 2-3 hours. Below are some of the images from these photography sessions. 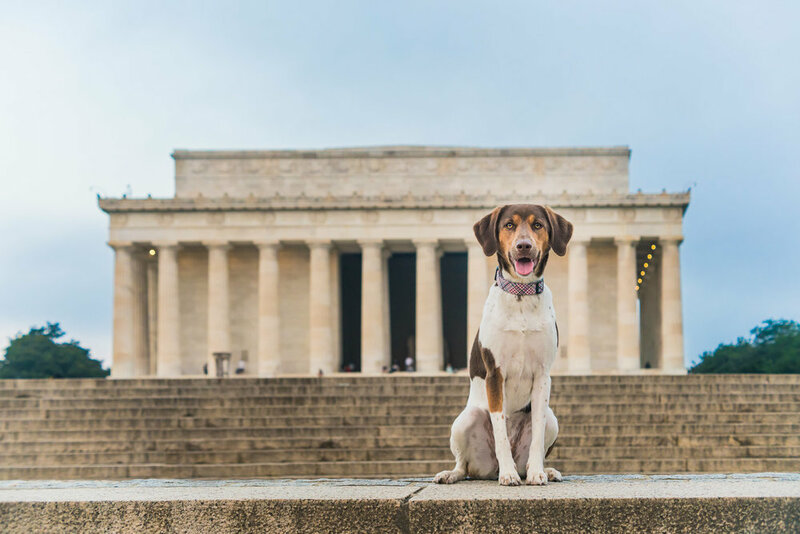 Lincoln Memorial is one of the most popular locations in DC. It is often very busy during the day and the evenings so we try to do these photography sessions in the morning. 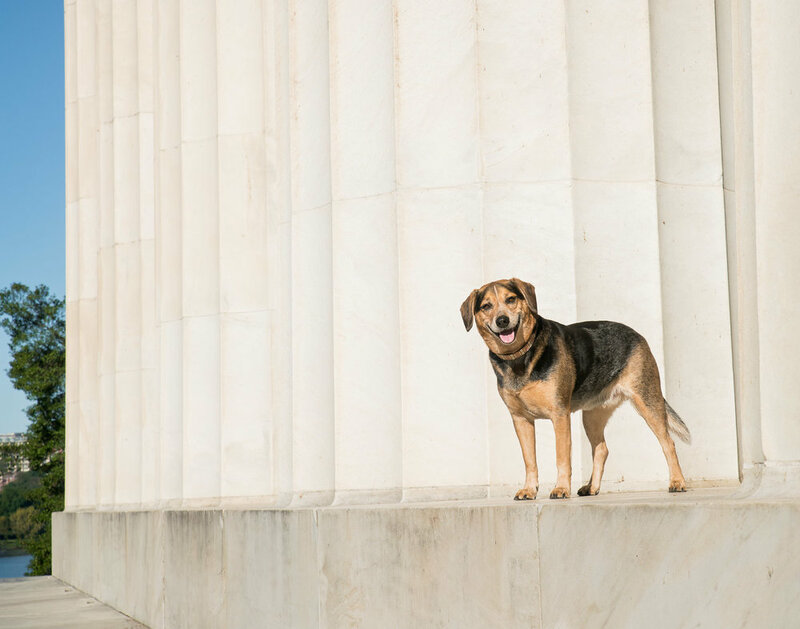 Generally one of our pet assistants will work with your dog to have them to the left or the right of the monument. We will start by capturing a traditional posed portrait with the whole monument showing. 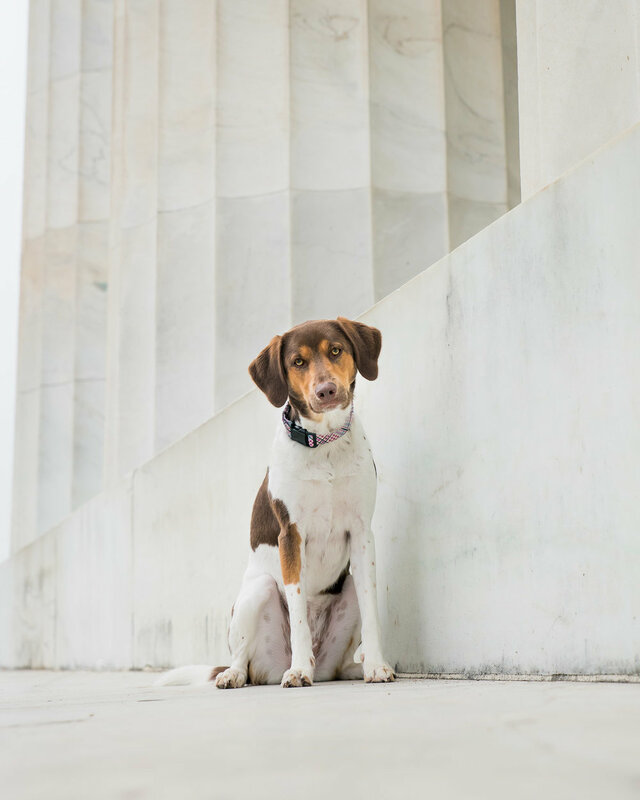 After that we will go up the Lincoln Memorial steps to get more detail shots with your dogs. This was a shot we captured of Olivia in the morning shortly after sunrise. Jefferson Memorial can be photographed anytime including sunrise. However, like Lincoln memorial it is often busy during the day and the evenings so morning sessions will work best. If it is during the evening the backside is less busy, and if we move to the front we can adjust the angle to make sure there are less people in the shot. 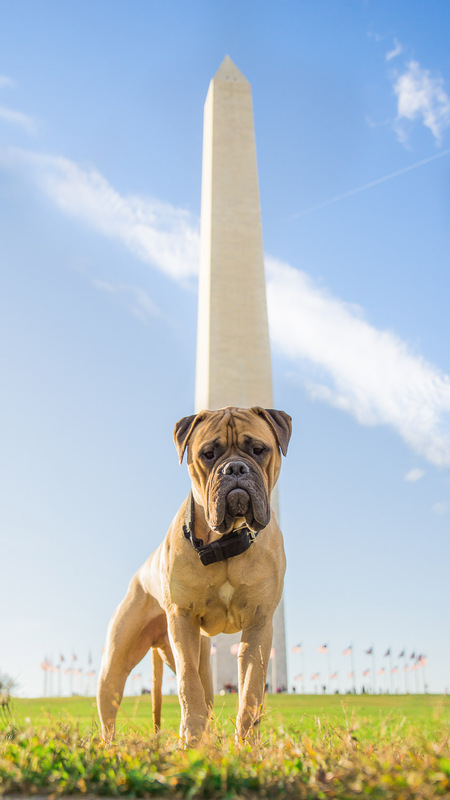 If you would like to see the whole monument we will usually photograph it while your dog is around the tidal basin. Here's Pablo again but this time we have a powerful shot from the front of the memorial. There were actually a bunch of people just below him. 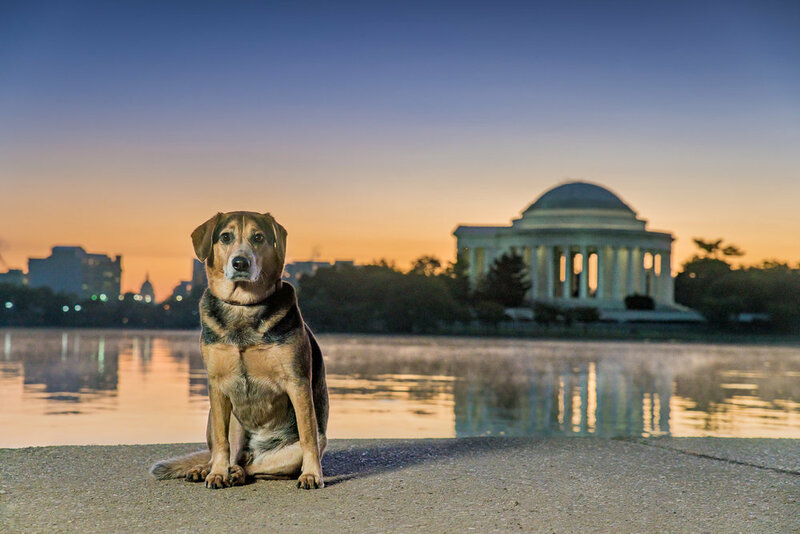 One more shot of Alfred, but this time you can easily see Jefferson Memorial in the background at sunrise. There is even a bit of morning fog on the water's surface. Washington Monument always stands out since it is the tallest structure in Washington, DC. It can be seen clearly from many locations. We can photograph it from FDR memorial, Jefferson Memorial, Lincoln Memorial, or the WWII memorial. So in many cases you can get Lincoln Memorial in your shot by just turning around. The memorial looks great at sunrise as well. 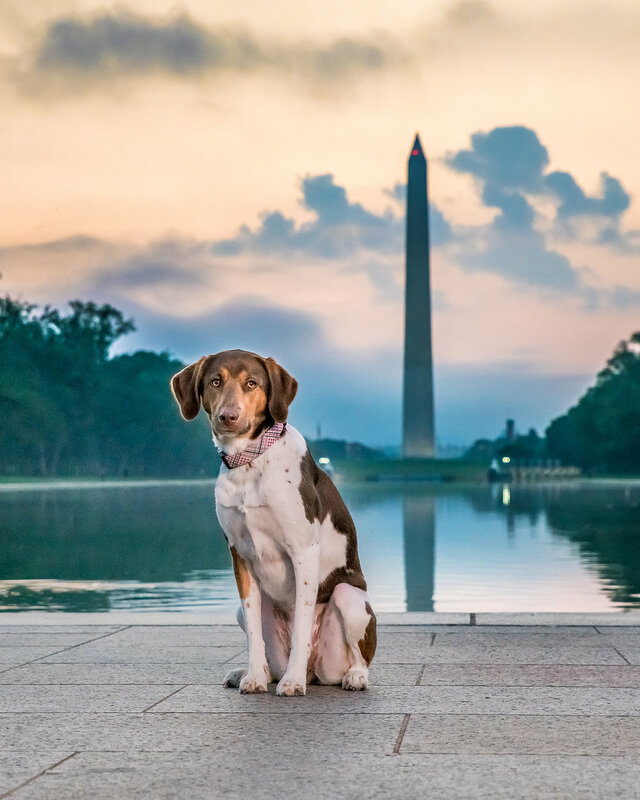 We have also done photography sessions at the World War II Memorial, Franklin Delano Roosevelt Memorial (FDR Memorial), and the US Capitol Building. Talk to us about what you would like to show about your pets and we can make it happen. 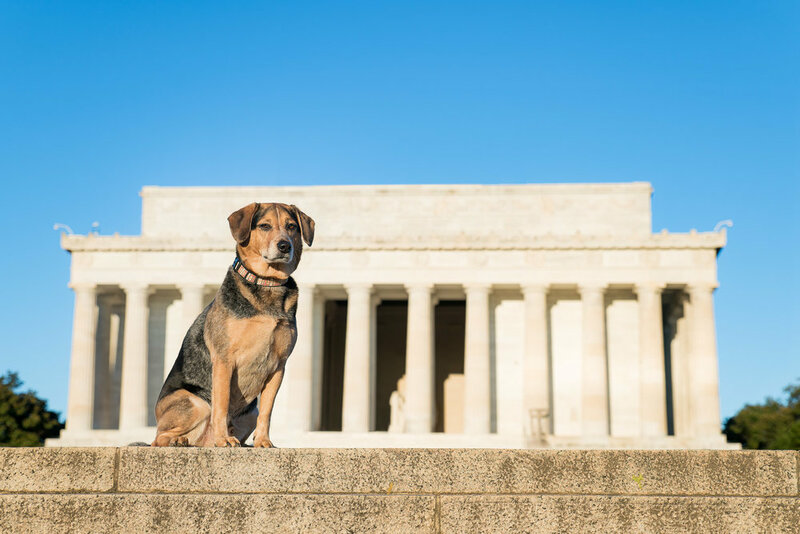 If you are looking for sessions in DC and you want to show your pet with some well known landmarks we are glad to discuss options for those photos. Email us@otlpets.com or call (240) 334-7694.